In July, Synapse and a team of subcontractors published the Avoided Energy Supply Costs in New England: 2013 Report (AESC 2013). This biennial report quantifies the benefits (“avoided costs”) that New England consumers will receive through 2028 from reducing their use of electricity, natural gas, and other fuels. The three major categories of avoided costs are: (1) energy cost savings for those consumers who reduce their energy use, (2) lower energy prices to all consumers resulting from reductions in energy use, and (3) reductions in carbon dioxide emissions costs resulting from reductions in energy use. The report results indicate that the combined benefits to all consumers from lower energy prices and to society from lower carbon dioxide emissions can be approximately equal to the energy cost savings to consumers who reduce their energy use. The analytical methods used in AESC 2013 could also be applied to quantify these benefits for other regions. The chart below illustrates the relative magnitude of each category of benefits for reductions in electric use (left bar) and natural gas use (right bar), using examples from Massachusetts. In the Massachusetts electric example, AESC 2013 projects that consumers who reduce their summer peak hour electricity use will save 9.6 cents for every kWh reduced (15-year levelized savings). That reduction in electricity use provides two additional sets of benefits. First, all Massachusetts consumers will see somewhat lower prices for electricity due to lower wholesale capacity and energy prices. The report refers to this price mitigation impact as the Demand Reduction Induced Price Effect (DRIPE) and estimates its value to be 3.4 cents for every kWh reduction in summer peak electric use in Massachusetts. Second, society will benefit from lower carbon dioxide emissions. The report estimates the value of that benefit to be 4.3 cents for every kWh of reduction in Massachusetts summer peak electric use. (This estimate assumes the value of reducing carbon dioxide emissions is $100 per ton.) Thus, while the direct energy cost savings to those Massachusetts consumers who reduce their summer peak hour electricity use are projected to be 9.6 cents per kWh, the total projected value of that reduction is 80 percent higher, at 17.4 cents per kWh. 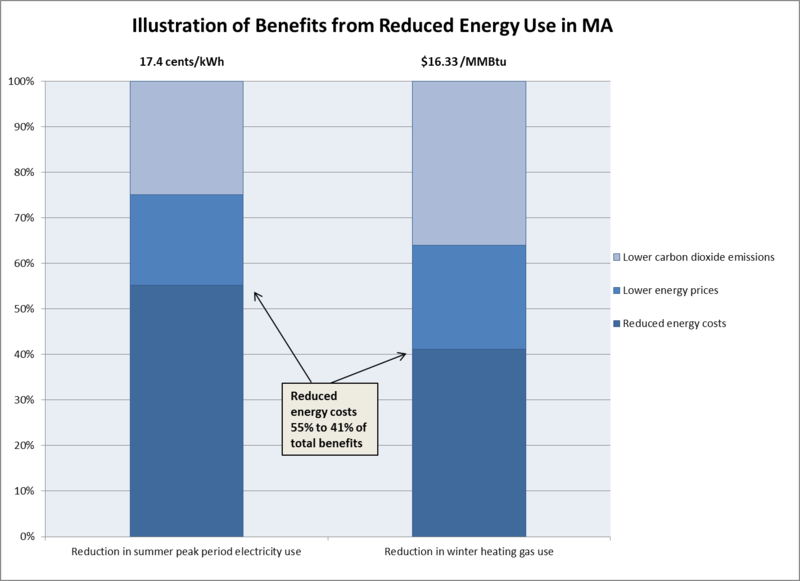 In the Massachusetts natural gas example, AESC 2013 results again indicate that a reduction in gas use will provide benefits beyond the savings realized by consumers who reduce their use. Massachusetts residential consumers who reduce their winter heating gas use will save $6.73 per MMBtu on a 15-year levelized basis. The additional benefits of that reduction to all Massachusetts consumers (and, in the case of reduced emissions, to society) are somewhat lower prices for natural gas and electricity worth $3.72 for every MMBtu of reduction and lower carbon dioxide emissions worth $5.88 for every MMBtu of reduction. The resulting total projected value of that reduction in gas use is $16.33 per MMBtu—about 140 percent greater than the direct energy cost savings. AESC 2013 was sponsored by efficiency program administrators throughout New England. Synapse led the preparation of this 350-page report with subcontractors Strategic Energy and Economic Research, North Side Energy, Resource Insight, and Sustainable Energy Advantage. View the full report.